NOW WITH MORE! This post was updated for 2019 to add 3 more successful case studies. Enjoy! It’s tough to get people’s attention through all the noise that’s out there. On average, we get 147 e-mails a day, only spend significant time answering about 12 of them, and delete 71 e-mails in under 3.2 seconds. And the truth is, your customers judge you on your ability to sell. So if you have an off day, you not only have to deal with not getting any conversions, but also with the negative judgements from your prospects. When you’re crafting your cold e-mail campaigns, it can be helpful to know what everyone else is doing to benchmark your own numbers so you know that you’re on the right track. What’s a good open rate? What’s a good reply rate? What does a good cold e-mail template look like? How many people should you be able to convert to a sales call? Today, we’ll answer those questions for you. We’ll peel back the curtain on some cold e-mail case studies and discuss which strategies companies used to boost their reply rates and conversions. Ambition is a software product that helps companies increase employee productivity. They built their platform with millennial employees in mind, and are used by such companies as Lyft, Carbonite, and Continuum. In this case study, they wrote about how they cold-emailed 578 prospects, got a total of 6 responses, and used follow up e-mails to get 67 additional responses (for a total response rate of about 12.6%). They ran a six-week campaign, targeted 291 VPs of sales as well as 287 VPs of sales operations, and ended up with a total of 73 new leads. Around half the recipients opened the initial e-mail but zero people replied. However, with each additional touchpoint, or follow up, more prospects replied to the initial e-mail. Notice that no single e-mail generated more than 18% of the grand total number of leads. In fact, the eighth e-mail generated just as many leads as the second! According to Ambition, the factor that mattered most here was just pure persistence. 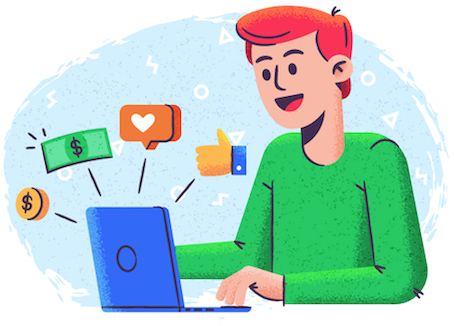 By following up constantly with prospects, they were able to skyrocket the number of leads they got versus if they just followed up once like most other sales reps. In fact, this was one of the problems we had at Growth Everywhere — there was a lot of manual work involved in keeping track of follow ups, and that was a major point of failure that kept cold e-mail response rates low. Once that was fixed, we saw a 333% increase in response rates! For prospects, your product isn’t at the center of their world, so if they don’t respond, it’s likely just because they’re busy — not because they’re not interested. Free Bonus Download: Want to receive the PDF version of this entire post? Click here to download it absolutely free. Shane Snow is the bestselling author of a book called Smartcuts: How Hackers, Innovators, and Icons Accelerate Success. He wrote the book to outline the process that highly accomplished people throughout history have used to achieve success in a short period of time. He’s also a journalist at Fast Company. In this post, he wrote about how he explored a cold e-mail strategy for anyone who wanted to connect with important people for mentorship and advice. To start off, he got the e-mail addresses of the 1,000 busiest business people in America — C and VP level executives from Fortune 500 companies and C level executives from the Inc 500. The average person gets 147 emails a day, but these execs get significantly more as a result of their status. Shane wanted to see whether he could come up with a strategy to “cut through the noise” in their inbox to grab their attention and get a response from them. I’m doing a study on cold emails and want to ask if you could share some thoughts on what differentiates an effective cold email from a bad one? Your insight will contribute to research I’m conducting to help a lot of people get better at email, which will make the world a little better for us all. Request (asking for their knowledge — i.e. “sharing your thoughts” — vs asking for a favor). short, vague subject lines (i.e. “quick question”) got 51.2% opens while longer, specific subject lines got slightly less opens at 48.8% — interestingly enough, the reply rate on the “quick question” subject line was around double that of the longer subject line. However, according to the case study, the previously mentioned variables (i.e. subject lines, length, purpose, etc.) played a much lower role in determining the results than expected — only 1.7% of those who received Shane’s e-mails actually responded. Jake Jorgovan is a creative strategist who helps consulting companies win dream clients. He wrote in this post how he was able to generate $12,030 just through cold email — including some Fortune 500 clients. According to Jake, there are two different ways you can approach cold e-mailing. The “quantity” approach — if you e-mail enough prospects, then you will inevitably land a sale. The only thing that matters here is playing the numbers game: send enough e-mails and you’ll probably close some deals. Shane Snow’s cold e-mail campaign of getting a 1.7% reply rate is a good example of this. The “quality” approach — focus on sending out fewer pitches, but make them top notch. For example, you might pick around 20-25 dream customers who you would do anything to get. Then you should choose your specific target audience. Ideally, this target audience should be similar to the customer you helped in your case study. For example, if you’re reaching out to dentists, then you should have a case study where you helped a dentist. If you’re reaching out to a Fortune 500 tech company, you should have a case study where you helped a tech company. It’s a psychological fact that people believe that they’re special and that their situation is unique. Because of that, they want solutions that feel like a “tailored fit” for them. If you worked with a tech company, you might be able to use those same fundamentals to help dentists, but dentists won’t feel like you can help them unless you show them that you’ve already worked with dentists. Next, Jake writes that you need to find a list of prospects. The ideal place to look for this kind of information is in sales or trade organization directories for the industry that you’re in. 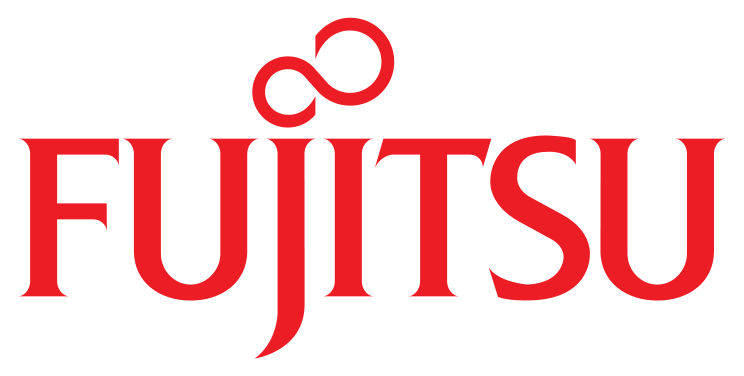 Recently I came across [Company name] in the [Directory where I found their information] and I wanted to reach out. My name is Jake Jorgovan and recently I finished up a website design project for [case study client] and wanted to reach out to similar companies. When I came across the [Client’s website], I noticed [review of 2-3 things that I found wrong with the client’s website]. With the [case study client], we were able to build a professional site and get it up and running in under three weeks. Their site is mobile friendly and extremely easy for anyone at the company to update. If you are interested in rebuilding your website, please let me know and we would be more than happy to help you out. Also, I have attached a case study for [Case study client] with a raving testimonial from the owner of the company. Thank you [Prospect name] and I look forward to hearing from you. According to Jake, the most important part of the e-mail is in the second paragraph where you list the 2-3 things you found regarding the client’s site/product/service that you feel you can fix. If you’re writing blanket statements that don’t feel tailored to the prospect’s specific situation, your response rates go down. I wanted to send a quick follow up to see if you received my e-mail from last week in regards to your new website design. Please let me know if you are interested and I look forward to hearing from you. Much like the Ambition case study, Jake was surprised to find that many prospects responded to the second e-mail after ignoring the first. LeadFuze is a lead generation product that helps salespeople quickly gather contact information of prospects and automatically send personalized e-mails. They’ve been used by companies like Bidsketch and CrazyEgg. Justin McGill, the founder LeadFuze, used cold e-mail to grow his company’s revenue to $30k/month in 12 months. From there he was able to look at a list of prospects that he could potentially add to a list. Once the relevant prospects were added, the software pulled information about the prospect. Question. The first sentence is absolutely crucial in an e-mail. This is the sentence that will show up on their phones and as a preview in their inbox. According to Justin, it’s not advisable to start off with an introduction about yourself because that just shows your prospects that they don’t know you. Value prop. Don’t go on and on about how amazing your service is and all that you have to offer. Cut to the core of your message quickly and talk about what makes you different from everyone else. CTA. Most salespeople end their e-mails in a generic, weak way (usually something like “I look forward to hearing from you.”). The best way to close an e-mail is to ask directly to schedule a call or ask a question to get a specific response. Like a normal e-mail blast, it’s important to let your prospects know that there’s a “way out” from receiving your e-mails and your follow ups. If you’re sending out e-mails to a list, then you already have an “unsubscribe” link that readers can click on to opt out of your e-mails. He explicitly states that it’s okay for the prospect to tell him not to follow up anymore. After the initial e-mail is written and sent, you should also have a follow up sequence ready. As we’ve seen before, the magic is in the follow up. Most salespeople never follow up, or if they do, they stop after the first or second time. Steli Efti from Close.io writes that he follows up as many times as necessary until he gets a response. In fact, once he followed up with an investor 48 times before getting a meeting — which led to that person investing in Close.io. In follow up e-mails, you shouldn’t just “check in” or rehash the same exact message that you already sent the first time. Instead, you should use this opportunity to send new, valuable information that could help your prospect move closer to making the decision. For example, you might want to include a relevant case study, or results that you got for someone else. By using a sales automation service like Outreach, Mailshake, or Reply, you can craft your own custom follow up sequence for prospects who don’t respond so that you don’t have to manually go in and send every single e-mail. Using this simple process, LeadFuze scaled to $30k/month within just one year. Crazy Eye Marketing helps small businesses and entrepreneurs plan, build, and optimize sales funnels. They use marketing automation systems to convert more leads into customers. In this case study, they wrote about a cold e-mail campaign they ran for a small mobile app company: they sent out 4,897 cold e-mails and analyzed what worked and what didn’t. First, Crazy Eye started off with a list of leads provided to them by the client, a mobile app company. After removing duplicates, they ran the list through a service called Kickbox, which helps verify whether the e-mail addresses are actually legit or not, and had a final number of 2,160 good addresses. Next, they used Reply to set up a cold e-mail autoreponder campaign. This way, you won’t have to comb through your inbox to see which prospects responded and which didn’t, and then copy and paste the right follow up e-mails to the right prospect. There’s a lot of potential for human error in this process, which is why using an outbound sales automation tool can save you lots of valuable time while doing the work more effectively. Crazy Eye then connected Reply to Gmail for the cold e-mail campaign. They created five different e-mail series and sent them to a few hundred people to test the effectiveness. From there, they sent the most effective series to the rest of the list. My name is Nathan and I am the founder of the Car App. We work with used car dealerships to help them stay connected with their prospective customers. The Car App is a mobile app for used car dealers. Our solution is 7 times more likely to result in vehicle sales than Craigslist, Autotrader, and eBay combined. Is it possible to get 15 minutes on your calendar to further discuss the benefits the Car App would bring to [company]? I’m sorry to trouble you again. At my company, the Car App, we make keeping in touch with prospective customers a breeze through our one-of-a-kind “push” messaging system that instantly, and automatically, notifies them when the car they want is in stock. Our mobile app not only makes your life easier, but generates more sales and revenue without any added effort. Who would be the person to speak to about this at [company]? I wanted to make sure that you saw my earlier message. I’d like to learn about the struggles you have with staying in touch with prospective customers at [company]. If you’re the appropriate person to speak with, what does your calendar look like for early next week? If not, who do you recommend that I talk to? These were the results of their three-email sequence. They received open rates around 50% for every one of their e-mails, and got reply rates just under 10%. Notice how the reply rate for the second and third e-mails is similar to the reply rate for the first e-mail. This shows that your follow up e-mails are equally as valuable as your initial outreach e-mails. Salespeople who don’t follow up are leaving a lot of money on the table. Marco Massaro runs a web consultancy that works with tech companies and high-growth startups. The consultancy works on UX design and web development. Marco closed a $15,000 consulting project with a cold e-mail campaign. Before diving in and blasting out e-mails to hundreds of people, he started off by outlining who exactly he was targeting. He needed to identify his ideal clients. Industry. Marco wanted to work with tech companies: SaaS, B2B, B2C, social. Company location. He wanted to work with English speaking companies only that were based in USA, UK, and Europe. Funding. To make sure they could afford his rates, he focused on companies that were at seed sage and Series A with at least $200,000 in funding. Revenue. If the companies had no funding, they would have to at least have $500,000 to $1,000,000 in yearly revenue. Company size. Marco targeted smaller companies because larger companies were able to afford employees to handle their web development and design in house. Person to e-mail. Lastly, he made a note of the people within the company who he would have to e-mail — the decision makers. Next, he had to find companies that matched this profile. He used Crunchbase because his target was mostly early stage tech companies, but other lead gen sources might include AngelList, or even software products like LeadFuze. 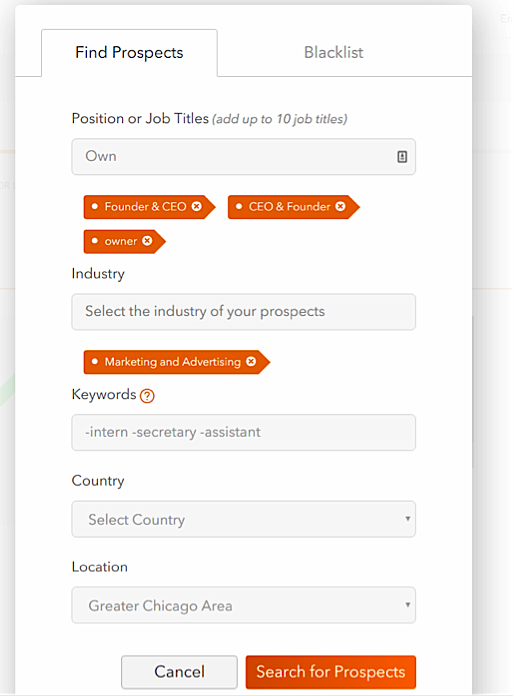 Outreach also has a Chrome plugin that allows you to quickly extract contact information from professional profiles on LinkedIn which makes lead gen more efficient. The next step was actually writing up the cold e-mail pitches and sending them out. I wanted to find out if you have any design needs at [company] (redesign, landing pages, UX, etc)? We can increase sales, engagement, conversions, and more through our design and UX strategies. Interested? Email me back, I’d love to chat. Notice how this e-mail doesn’t jump right into an introduction in the first sentence? People don’t care about you until they are interested in what you have to offer first. You shouldn’t waste your valuable first few sentences talking about something that your prospect isn’t going to read anyway. The e-mail also addresses the recipient by name. However, it could be a bit more personalized as it doesn’t include how web development or design consulting could help the prospect with their specific situation. Marco sent this e-mail to 500 prospects, received 67 replies, and got a response rate of around 13.4%. Apart from personalizing it more, other ways that the process could be improved include 1) A/B testing subject lines or CTAs, and 2) integrating with an outbound sales automation tool to keep the campaign more efficient. According to Marco, the lack of structure here made it confusing at times to remember where they were in the sales process for each prospect. Bryan Harris is the founder of Videofruit, a company that provides step-by-step plans for entrepreneurs to grow their business. He decided to pitch HubSpot about creating a video series for their blog. I’m Bryan. 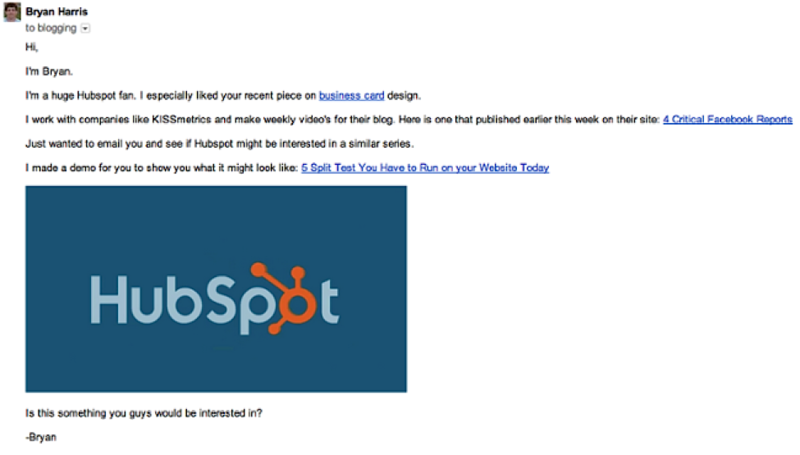 I’m a huge HubSpot fan. I especially liked your recent piece on business card design. I work with companies like KISSmetrics and make weekly videos for their blog. Here’s one that published earlier this week on their site. Just wanted to email you to see if HubSpot might be interested in a similar series. Even though this was the first time he was sending them an e-mail pitch, it wasn’t the first time that the folks at HubSpot heard his name. Bryan had already been interacting with HubSpot bloggers and content for nearly two years. He was reading, commenting, sending “thank you” e-mails, and more. So when Ginny Mineo – the person on the receiving end of his pitch – looked up his contact “record” in the HubSpot system, she quickly discovered that he wasn’t just a random stranger. By reading their blog and understanding the sort of guest post pitches they like getting, he was able to write an e-mail that stood out compared to most other e-mails. One of the things marketers hate most about being on the receiving end of a cold e-mail pitch is that the fact that the sender doesn’t consider them “special.” In many cases, the sender is just copying and pasting a template, and blasting it to hundreds of people from a contact list. This makes recipients feel like the sender doesn’t really care about them. But Bryan took a different approach. Instead of sending HubSpot a generic cold e-mail, he decided to invest time in creating a custom-made, minute-long video sample of what he could do for them. This isn’t something that can be cranked out in a few seconds through copy and paste; creating a custom video takes hours or even days. Bryan had to write a script, produce the video, go through the editing process, etc. 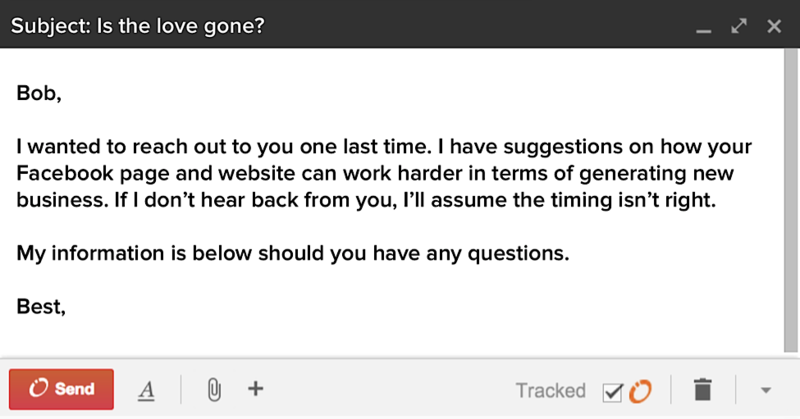 And after all that work, he had to be okay with the possibility of not getting a response from HubSpot. The more personalized you make your pitch and the more time you spend crafting something that doesn’t seem like it can be (or was) replicated, the more likely it is that you’ll get a response. Most cold e-mails usually end with an “ask” of some kind, like the sender trying to get a phone call or an in-person meeting with a prospect. But according to Jeff Molander, that might not be the best idea. Instead, he suggests a different approach – getting prospects to talk about themselves. Subject: How secure are your printers? Real quick – how secure are your copiers and printers at XYZ LLC? Did you hear about the Illinois law firm – sued because the janitor removed their hard drives? He walked away with hundreds of thousands of documents. Are you doing everything possible to mitigate your risk? I don’t pretend to know your situation, but I’m curious. How are you managing security of your printers/copiers at XYZ LLC? The reason this works is because it helps customers realize that they have a problem, and encourages them to talk to you about it. It starts the conversation painlessly. By asking customers about their problems before you try to jump on a call and talk to them, you’ll have a better chance of developing a relationship. You’ll also separate your e-mail from the hundreds of other cold e-mails that your prospects get in their inbox. One of Lead Genius’s clients ended up increasing their response rate from zero to 28% with one cold e-mail. The introductory sentence. 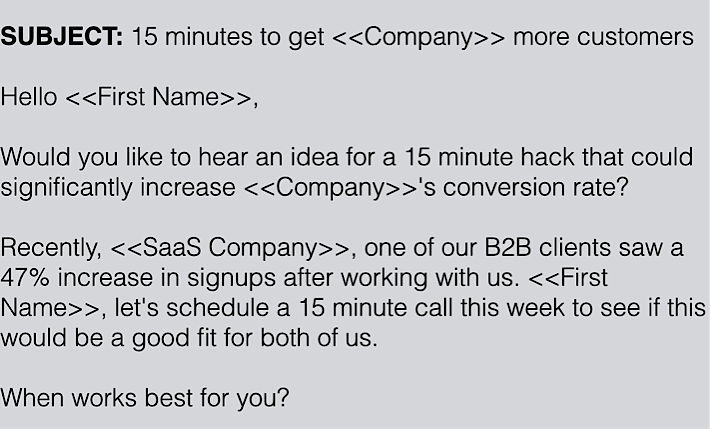 The first sentence of the e-mail says: “Would you like to hear an idea for a 15 minute hack that could significantly increase [company’s] conversion rate?” The word “hack” and “15 minute” both make it sound like something that won’t take up much of the prospect’s time. Credibility. The e-mail builds credibility by sharing a quick case study of a B2B client who saw a 47% increase in signups. Call to action. The call to action for a 15 minute call sounds much more appealing after the recipient sees that they’ll get a “15 minute hack” to increase their conversion rates. Nobody wants to get on the phone and be sold to, but they would want to hear about how they can improve their conversions. I’ve said it before and I’ll say it again: cold e-mails are tough. There are many steps involved, and for most people it can be pretty time consuming. You have to identify who exactly you’re targeting, scrape the Internet to figure out where those people are hanging out, and then figure out what their e-mail addresses are. Finally, it comes down to how well you conduct your research of the people and the companies you’re targeting, how personalized your message is, how much of an attention grabber your subject line is, and how specific your call to action is. To make things more efficient, remember that you can always use software tools to automate your processes. Tools like Outreach, Sendbloom and Reply can help you craft the perfect follow up sequence for your prospects (so you never have to remember who’s in what part of the sales sequence) and also track all your data. Now that you’ve had an “insider’s look” into some highly successful cold e-mail campaigns, you know exactly what sort of templates to use, what numbers to expect, and how to improve the templates going forward. If you get all these points right and send out a massive volume of e-mails, you could see a number of responses that are large enough to change the course of your business. How will you craft your next cold e-mail campaign? Leave your answer in the comments below.